In this Wednesday, Oct. 31, 2018, photo, students dance atop a bus to music during a Vote for Our Lives rally at the University of Central Florida in Orlando, Fla. Nine months after 17 classmates and teachers were gunned down at their Florida school, Parkland students are finally facing the moment they’ve been leading up to with marches, school walkouts and voter-registration events throughout the country: their first Election Day. Nine months after 17 classmates and teachers were gunned down, survivors of the Parkland school shooting are voting for the first time. They have mobilized tens of thousands at rallies and crisscrossed the country to register teen voters. 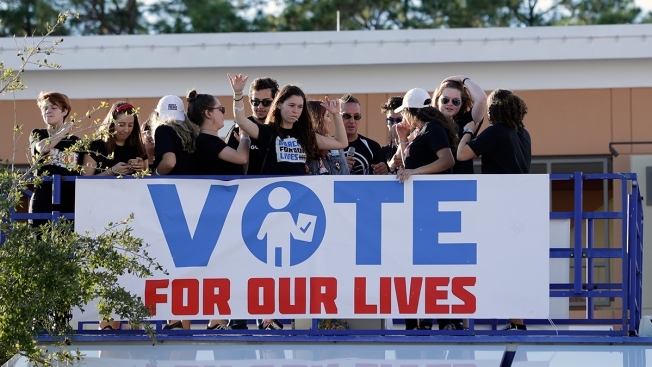 The Marjory Stoneman Douglas High School student activists set their sights on the 4 million U.S. citizens turning 18 this year. They're hoping to counteract voter apathy among young people during midterm elections. Many of the activists postponed college plans to mobilize young voters. Many support gun reform, in the name of their fallen classmates. It's been a whirlwind for the students, with celebrity support from Oprah to Kim Kardashian, a Time magazine cover and late-night TV spots — but all of it lost unless it motivates students to vote.